You stay in the city centre, just a short walk from many of the city's attractions. Let the kids burn some energy in our playroom, treat yourself to something refreshing to drink, and enjoy a moment's relaxation in our comfortable lobby. After a day packed with experiences, you can regain new strength with a sauna or clear your head with the help of our gym equipment. If you'd rather let someone else do the hard work, sit back in our lobby and watch the current sporting events. Kids who still have energy to burn can amuse themselves in our playroom which is packed with fun things to do. Enjoy a well-earned drink at our bar and when it's time for something to eat, head to our restaurant. 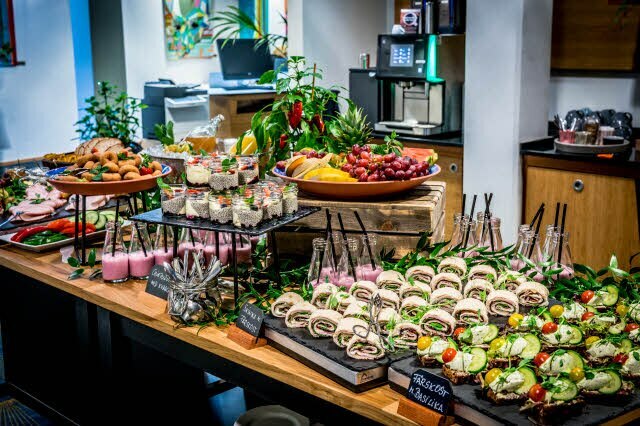 A lunch buffet is also served here, suitable for anyone who needs to replenish their energy during an intensive conference day in one of our meeting facilities. Scandic S:t Jörgen is located in the city centre on Gustav Adolf Square. The area is teeming with restaurants, department stores and boutiques. Set your inner child free in the new Hylliebadet swimming pool or stretch out on Ribersborg beach, where you can also take a dip in the cold-bath house in winter, then thaw out in the sauna. Be enchanted by the music of Malmo Opera, and if you're in the mood for some medieval vibes, walk to Malmo Castle, the oldest preserved Renaissance castle in Scandinavia. Choose from 12 modern rooms for your conference at Scandic S:t Jörgen in Malmo. Its central location and proximity to Malmo's business district makes our hotel the perfect base to hold your meeting.